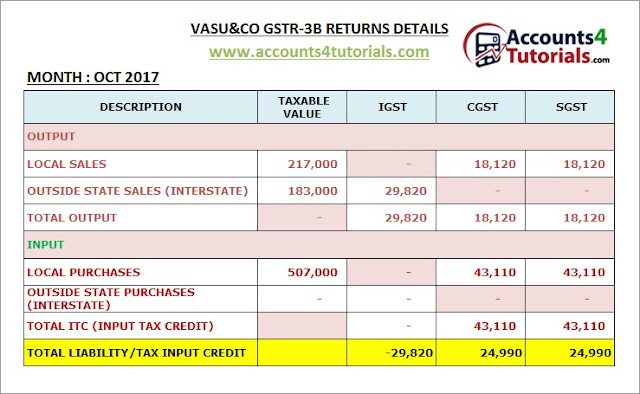 The Summary View gives the taxable value of Local & outstate Sales and break-up for IGST, CGST, SGST and CESS categories. As prescribed by GST Law VASU & CO., first utilized ITC of CGST Rs.24,990 to set off IGST liability of Rs.29,820. After this adjustment IGST liability is Rs. 4,830. Later, SGST input credit of Rs.24,990 is set off against Balance IGST liability of 4,830. SGST balance after set off of IGST liability will be carried over to the next period. > Select GSTR3B tile, click the PREPARE ONLINE button. > Select 'Tax on outward and reverse charge inward supplies' and enter the following data and click on confirm button. > Select 'Eligible ITC' and enter the following data and click on confirm button. > From GSTR-3B Monthly Returns, Click on Submit Button. > Follow the rules and complete GSTR-3B returns.